Rí Na Mara rich Face cream for daily moisturising, combines wild Organic Seaweed extracts and natural Botanical extracts, this unique formula helps protect against harsh environmental and free radical damage, minimises the appearance of fine lines and wrinkles, helps improve visible skin firmness, restoring your skins natural moisture balance. Formulated with sensitive skin in mind, the soft velvety texture is enriched with vitamins, minerals, protective anti-oxidants and amino acids which hydrate, nourish and stimulate skin cells leading to intense replenishment, elasticity and radiance thanks to the widely recognised benefits of seaweed. Rí na Mara contains a powerful blend of naturally active botanical extracts, Aloe Vera, Shea Butter, Avocado Oil and Ginkgo Biloba, ingredients proven to intensively moisturise dry skin, natural source of vitamin E and antioxidants helping to plump your skin, smooth fine lines and reveal a more radiant glowing complexion. Wild organic Seaweed and botanical extracts deeply cleanses the skin, eliminating impurities and providing essential mineral hydration. Boosts the skin's natural moisture balance, and helps regain suppleness and healthy glow. Naturally active ingredients including clay are combined with algae and botanical extracts, the marine plants have a toning, revitalising and gentle exfoliating action, leaving the skin feeling smooth, calm, for a radiant complexion. To optimise Seaweed effect follow with Rí Na Mara Face Cream. All Rí Na Mara products incorporate the purest natural ingredients from marine or plant origin and are suitable for sensitive and all skin types. Contains No Parabens, No Sodium Lauryl Sulfate, No Harsh Chemicals, No GMO's, No Animal Testing No Animal Derivatives, No Mineral Oil. Natural Ingredients, Soft Manufacturing Processes, Environmentally friendly practices, No irradiation of end product. Rí Na Mara Purifying Cleansing Water is formulated with sensitive skin in mind, using a unique combination of organic mineral and nutrient rich algae extracts, natural botanicals and protective anti-oxidants, which have been slowly and meticulously distilled as one to form the basis for our skin care range. Micellar gentle cleansing water infused with precious marine & plant essences, immerse the skin with proteins, vitamins & anti-oxidants to condition and preserve the skins natural moisture balance. Dissolves makeup from face, lips & delicate eye area. Removes impurities, unclogs pores and tones, leaving your skin soft, cleansed and refreshed. Cleanse,Tones & Moisturises. Caring, non-irritating formula, perfectly suitable for sensitive & all skin types. All Rí Na Mara products incorporate the purest natural ingredients from marine or plant origin and are suitable for sensitive and all skin types. Contains No Parabens, No Sodium Lauryl Sulfate, No Harsh Chemicals, No GMO's, No Animal Testing No Animal Derivatives, No Mineral Oil. Natural Ingredients, Soft Manufacturing Processes, Environmentally friendly practices, No irradiation of end product. Wonderfully rich, creamy formula with organic mineral and nutrient rich Seaweed extracts, natural botanical extracts Vitamin E and Shea butter. Deeply moisturises, nourishes and firms your skin. Protective anti-oxidants help replenish and restore natural moisture balance. Ideal as a daily body moisturiser, especially suited for dry skin areas. Highly regenerating, conditions and repairs dry and damaged hands, nails and cuticles. Immerse yourself in this luxurious and relaxing wild seaweed soak, and just feel the tension disappear. Rich in vitamins, proteins and minerals which help eliminate impurities accumulated throughout the day. Detoxifies and remineralises due to active ingredients, helps re-energise your body and alleviate aching joints. Calming marine aroma with pure flower and plant essences. 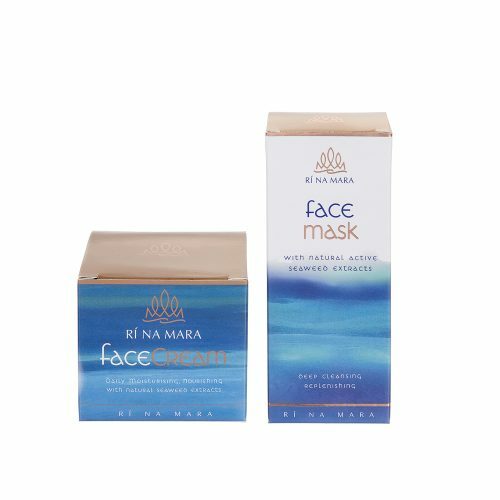 All Rí Na Mara products incorporate the purest natural ingredients from marine or plant origin and are suitable for sensitive and all skin types. Contains No Parabens, No Sodium Lauryl Sulfate, No Harsh Chemicals, No GMO's, No Animal Testing No Animal Derivatives, No Mineral Oil. Natural Ingredients, Soft Manufacturing Processes, Environmentally friendly practices, No irradiation of end product. This nourishing, toning lotion, hydrates and restores elasticity, leaving the skin soft and silky smooth. The algae extracts rich in vitamins, proteins and minerals effectively help drain and eliminate toxins, anti-cellulite, firms and regenerates the skin The natural ingredients from marine and plant origin, wild organic Seaweeds, organic Aloe Vera and Shea butter are perfect as an after sun soother. Formulated with sensitive skin in mind, the soft velvety texture is enriched with vitamins, minerals, protective anti-oxidants and amino acids which hydrate, nourish and stimulate skin cells leading to intense replenishment, elasticity and radiance thanks to the widely recognised benefits of seaweed. Luxurious, mild body wash, gently cleanses and cares for your skin, providing it with moisture, leaves you feeling refreshed and revitalised every day. Organic Seaweed extracts, rich in minerals, vitamins, anti-oxidants effectively nourish and protect the skin’s moisture barrier. Botanical extracts and Aloe Vera, soothe and tone leaving your skin silky soft and smooth. Treats your senses to a fresh marine aroma of pure flower and plant essences. To optimise seaweed effect, treat your skin with nourishing Rí na Mara Body Lotion or Body Cream. Formulated with sensitive skin in mind, the soft velvety texture is enriched with vitamins, minerals, protective anti-oxidants and amino acids which hydrate, nourish and stimulate skin cells leading to intense replenishment, elasticity and radiance thanks to the widely recognised benefits of seaweed. All Rí Na Mara products incorporate the purest natural ingredients from marine or plant origin and are suitable for sensitive and all skin types. Contains No Parabens, No Sodium Lauryl Sulfate, No Harsh Chemicals, No GMO's, No Animal Testing No Animal Derivatives, No Mineral Oil. Natural Ingredients, Soft Manufacturing Processes, Environmentally friendly practices, No irradiation of end product. This Irish, luxury hamper basket contains four Ri na mara Seaweed Skincare products. Beautiful Face cream, Face mask, Shower Gel and seaweed Foaming bath. All four products are lovingly hand-wrapped in a beautiful wicker basket. For a truly unforgettable gift. Daily Moisturising, Anti Ageing rich cream combines wild Organic Seaweed extracts and natural Botanical extracts, this unique formula helps protect against harsh environmental and free radical damage, minimises the appearance of fine lines and wrinkles, helps improve visible skin firmness, restoring your skins natural moisture balance. Powerful blend of naturally active marine and botanical extracts, Aloe Vera, Shea Butter, Avocado Oil and Ginkgo Biloba, ingredients proven to intensively moisturise dry skin, natural source of proteins, vitamin E and antioxidants helping to plump your skin, smooth fine lines and reveal a more radiant glowing complexion. All Rí Na Mara products incorporate the purest natural ingredients from marine or plant origin and are suitable for sensitive and all skin types. Contains No Parabens, No Sodium Lauryl Sulfate, No Harsh Chemicals, No GMO's, No Animal Testing No Animal Derivatives, No Mineral Oil. Natural Ingredients, Soft Manufacturing Processes, Environmentally friendly practices, No irradiation of end product. This Irish, luxury hamper basket, contains the full range of Ri na mara Seaweed Skincare products. Beautiful Face cream, Face mask, Body cream, Body lotion, Shower Gel and seaweed Foaming bath. All six products are lovingly hand-wrapped in a beautiful wicker basket. For a truly unforgettable gift. Wonderfully rich, creamy formula with organic mineral and nutrient rich Seaweed extracts, Vitamin E and Shea butter. Deeply moisturises and nourishes, ideal as a daily body moisturiser and especially suited for dry skin areas, conditions and repairs dry and damaged hands, nails and cuticles. Nourishing and moisturising lotion leaves the skin soft and silky smooth. Formulated with sensitive skin in mind, the soft velvety texture is enriched with vitamins, minerals, protective anti-oxidants and amino acids which hydrate, nourish and stimulate skin cells leading to intense replenishment, elasticity and radiance thanks to the widely recognised benefits of seaweed. All Rí Na Mara products incorporate the purest natural ingredients from marine or plant origin and are suitable for sensitive and all skin types. Contains No Parabens, No Sodium Lauryl Sulfate, No Harsh Chemicals, No GMO's, No Animal Testing No Animal Derivatives, No Mineral Oil. Natural Ingredients, Soft Manufacturing Processes, Environmentally friendly practices, No irradiation of end product.